2019-20 Application Now Available! -- ALSO -- Open House / Fundraiser date set for July 13, 2019! Click on the Application Form tab for instructions and to download the application. The application deadline is June 15, 2019 (postmark date). The Helen Gee Chin Scholarship Foundation will be holding its 8th annual fundraiser on Saturday, July, 13, 2019, at Calvin Chin's Martial Arts Academy in Newton, MA. Although we will not be charging tickets for the performance, we are still planning to raise funds through a silent auction and donations. Go to our calender event page for more details. 2018-19 scholarship recipients have been chosen! This year, eight deserving recipients have been awarded a collective total of $16,500 in college scholarships. The 2018-19 awards bring the total amount awarded to $100,000 since 2011! Time to add a few more faces to the collage. For the list of the 2018-19 winners and more details, click here. The Helen Gee Chin Scholarship Foundation holds its annual fundraiser every May or June, with a performance by students and instructors from Calvin Chin's Martial Arts Academy. 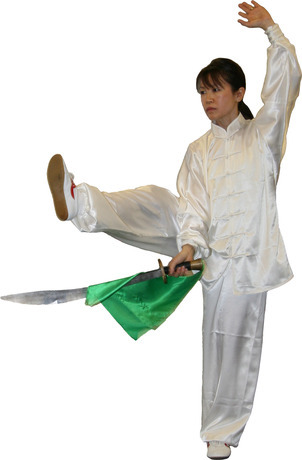 This spectacular event includes lion and dragon dances, Kung Fu, Tai Chi, flags, and weapons. We hope you will support the cause and check back for the Save a Date notice in 2018. Since 2011, we've awarded more than $83,000 to 41 students from 16 states and 25 martial arts schools! Net proceeds from the sale of ads, tickets, t-shirts and DVDs benefit the Helen Gee Chin Scholarship Foundation, a 501(c)(3) charity. 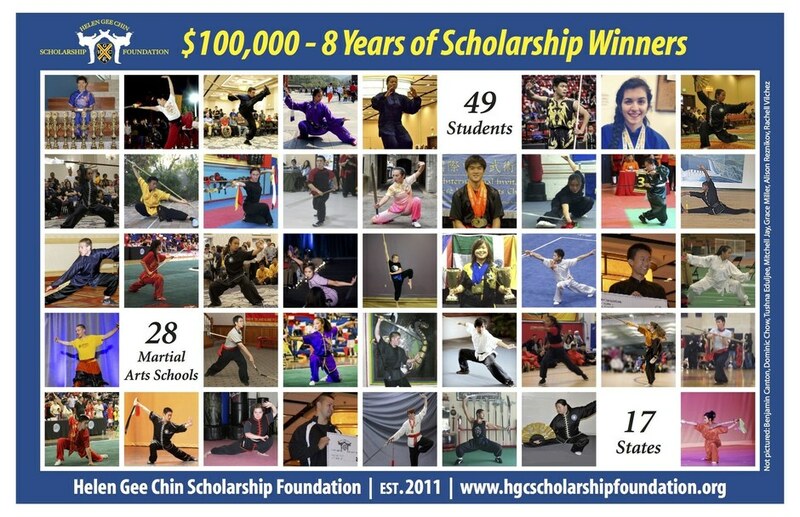 The Helen Gee Chin Scholarship Foundation was founded on March 7, 2011, to honor the memory of Helen Gee Chin, wife of Sifu Chin of Calvin Chin’s Martial Arts Academy, Inc. Simo was the administrator at CCMAA for 15 years and was involved with preserving the history and promoting the practice of traditional Chinese martial arts. She was beloved by her husband, the students of the Academy that she ran with him, and by the martial arts community as a whole. The Foundation is offering college scholarships to encourage academic achievement and motivate individuals to become serious students of the Chinese martial arts. The scholarship is open to students who plan to enroll full-time as an undergraduate at an accredited U.S. four-year college or university and meet the minimum eligibility requirements: U.S. citizenship or permanent residency, five or more years* of study in Chinese Martial Arts (Kung Fu, Wu Shu, or Tai Chi), and a “B” average grade or better. Scholarship recipients are selected based on criteria such as martial arts study and achievement*, academic achievement, a written essay, and participation and leadership in community and school activities. Further details about eligibility and the selection process can be found on the scholarship application. The Foundation is based in Newton, Massachusetts at Calvin Chin’s Martial Arts Academy Inc. (“CCMAA”). The Foundation is funded by donations, which it solicits primarily within the Chinese martial arts community, and through public support. The Foundation believes that both the solicitation and the award processes will encourage academic achievement by young practitioners of the Chinese martial arts. * The 5 year study minimum and expectation of tournament competition may be reduced in the case of special life circumstances (see Section 10 of the application).